On the occasion of the 25th Anniversary since its establishment, Ghaqda Drammatika Ghajnsielem, in collaboration with the Ghajnsielem Local Council, will be presenting the original passion play Id-Dawl tad-Dinja, by script writer JoAnne Debrincat. What caused a Samaritan woman, Tamar, to leave hastely for Jersualem. What will she find and with whom shall she meet. What happened to Mary of Magdalene and why is she not in her right state of mind. Who is Valerius and how does he know Tamar. The answer to all of these questions and more can be found in the passion play Id-Dawl tad-Dinja. Accompanying Tamar is her brother Ruben who has lost his eyesight in an incident. However who in reality is living in the dark. The cast is made up of around 40 actors. Stage design is by Franco Ciangura with various people being involved backstage. The direction of this play is in the hands of JoAnne Debrincat. 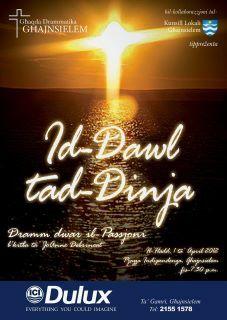 Id-Dawl tad-Dinja will be staged at Independence Square, Ghajnsielem, Gozo on Sunday 1st April 2012 from 7.30pm onwards. Entrance is FREE. Seating for this performance will be on a first come first served basis. In the case of bad weather the play will be performed on Monday 2nd April 2012 at the same time and place.